Odd and unusual are two words that spring to mind when imagining Guthrie writing a letter in praise of Cage. (He also praises Armenian composer Alan Hovhaness—Guthrie spells it “Hovaness”). Written in 1947, it is the kind of text one wants to quote in its entirety. Fortunately, we have the reproduction above, and you can read it for yourself. What isn’t reproduced is the postscript, in which Guthrie wrote: “I need something like this oddstriking music to match the things I feel in my soul tonight.” He also wrote that that morning, his wife, Marjorie, had “given birth to a big 7-pound boy”—Arlo. 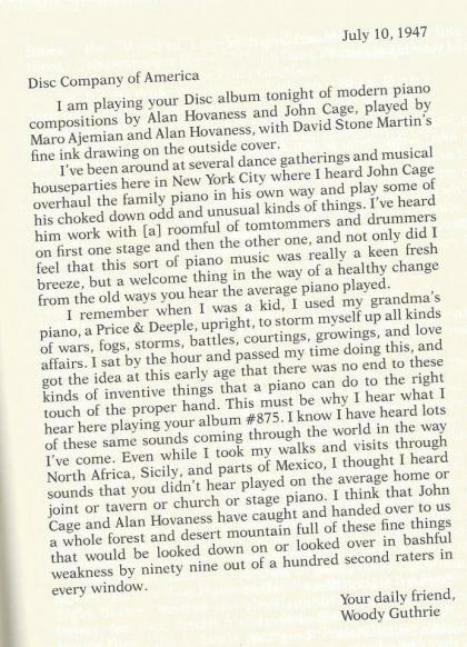 Guthrie’s letter references a (now extremely rare) two-disc set entitled Piano Compositions by Alan Hovhaness and John Cage played by Maro Ajemian and Alan Hovhanes, featuring a hand-drawn cover by acclaimed jazz-record illustrator David Stone Martin. According to LA Times music critic Mark Swed, the Cage composition on Guthrie’s 78-rpm record was the prepared piano solos from Cage’s Amores, composed in 1943. Below, watch a performance of the “oddstriking” Amores by Spanish ensemble Neopercusión. Thanks to Tristan for pointing us to this letter originally blogged over at Stool Pigeon. This is great and your research is amazing! This amazing two-disc set changed my life. My father bought it for me ca. 1951 (I was 6) and I loved it right away. Contents are: Disc 1–Hovhaness Mihr, Part I; Mihr, Part II; Disc 2–Cage: Amores I & IV; Hovhaness Invocations to Vahakn, IV & V. Producer was George Avakian who had to sign his name in the Armenian alphabet since he was under contract to Columbia Records. Guthrie stayed at Topanga Canyon in L.A. with Will Greer & Harry Hay. Hay was a friend of Cage, and helped produce Cage’s first concert at the Santa Monica Women’s Club. Wow, how amazing! Beautiful piece of research and revealing. Thank you for this post full of grace–Guthrie’s letter, your background info, and Cage’s beautiful Amores. I wish Hovahnes’s Mihr could have also been embedded. This is a great post. So exciting to read and think about the forever noble and great Woody. we sure could use him right about now.